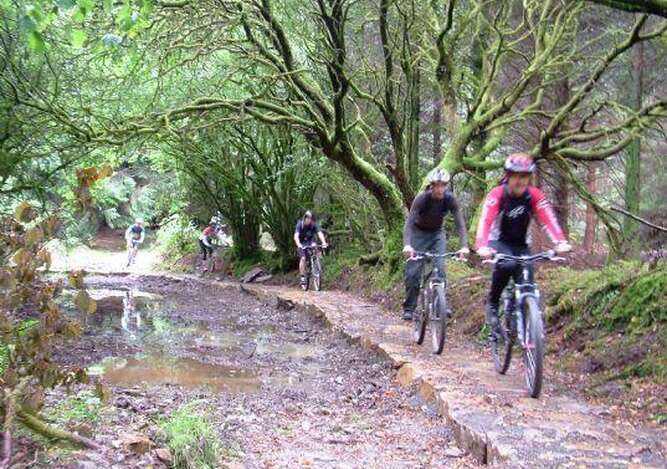 Three dedicated mountain bike trails are situated in the Brechfa Forest, only a couple of miles from Ty Mawr. The hotel is a perfect base for exploring these new routes and we also have storage for your bicycles. If you do not have a bike, or don’t fancy bringing yours with you, we can arrange hire from a nearby company. They can also offer you guided tours with a fully qualified SMBLA trail leader around the forest. The opening of the trails was part of a long-term regeneration partnership project between Forestry Commission Wales, Carmarthenshire County Council and the Welsh Assembly Government which aims to establish Brechfa Forest as a premier mountain biking destination in Wales. The Derwen trail, a green-graded route which starts one mile from Ty Mawr at Byrgwm, enables families and beginners to enjoy the beauty of ancient natural woodland as it snakes through 10km of Brechfa forest. The purpose-built Gorlech mountain bike trail starts at the village of Abergorlech which is 4 miles along the Cothi Valley from Brechfa. The route is 20km long and takes riders over a wide variety of terrain, incorporating existing forest tracks and sections of technical single track featuring drops, tabletops, berms and off-camber sections that have been designed to maximise the contours of the Brechfa Forest. The black-graded Raven trail, designed by Rowan Sorrell and Brian Rumble, raises Brechfa’s take on mountain biking to the next level. Suitable only for proficient bikers, the trail effortlessly mixes up the more traditional narrow woodland single tracks with Brechfa’s signature brash descents:fast, undulating trail that sweeps between trees and flows sinuously into berns and over jumps. This trail takes you out into the more interesting corners of the forest and creates a ride that involves the forest’s unique environment, from spooky mossy overhangs to the magnificent Douglas fir Northshore Bridge. Some stunning scenery and well engineered trails put Brechfa right up there with the best of the Welsh trails centres. Roller coaster downhills and plenty of air time:need we say more!